The Mustang was an instant hit when it first appeared, and popularized the term “pony car”. This refers to an affordable, 2-door, short trunk, long hood and V-8 engine powering a rear-wheel drive, and became the inspiration for similar styles from other auto manufacturers. The Mustang has kept its lines remarkably well over the decades, and everyone has their favorite production year. All we know is, at this year’s PITS show, we’ll see every kind there is, and from all over the country. PITS 2018 breaks into 2 main parts. Wednesday and Thursday are for the join-in enthusiasts to take the Shine Run. This is a 2-day run to 13 stops in the area, with time to spare and a bit of sightseeing allowed – it’s intended as a leisure run, not a race. Each stop provides a playing card, that eventually makes up a poker hand. Prize money is won by the best 5-card hand at the end of the 2-day run! The Shine Run also includes both ways on the famous Tail Of The Dragon, US 29 highway, with 318 curves in 11 miles! It’s called America’s number one motorcycle and sports car road. 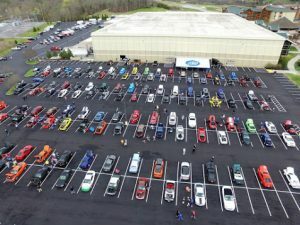 Friday is the day of the big PITS 2018 Show, held in over 100,000 square feet of display area in the Convention Center, with hundreds of classic and hot-running ponies, vendors – and some very special vehicle displays. The outside car lot will also include a swap meet. Saturday is the All-Ford Cruise-In, with anything Ford (and cool) welcome to drive up and flaunt itself. There are dozens of categories of awards, both indoor and outside, with awards presented at 3 pm. For full information see the PITS 2018 website and Facebook page.